"President @barackobama and his family welcomed Pope Francis (@newsva) at Joint Base Andrews today after his four-day visit to Cuba. The president's personal welcome was a sign of respect. Presidents rarely greet foreign visitors at Andrews, instead waiting for them to make their way to the @whitehouse. 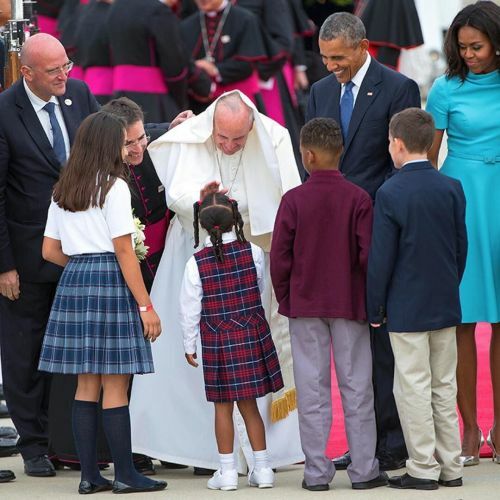 No speeches were planned for the arrival but the Vatican selected four schoolchildren from different #Catholic schools in the Washington area to greet #PopeFrancis. The pope's arrival kicks off a six-day visit that will also take him to New York and Philadelphia. Photo by @nytmills, one of the @nytimes photographers who will be covering the #papalvisit." By nytimes on Instagram.